From the outset we decided that bees were going to be an important part of The Woodland Farm – not just for pollinating the orchard fruits – but also in the long-run for honey production and working with nature for good biodiversity. The idea of a permaculture farm is to give as much opportunity for wildlife diversity as possible. This then rewards you with protection from pests and disease and helps you have better crops. 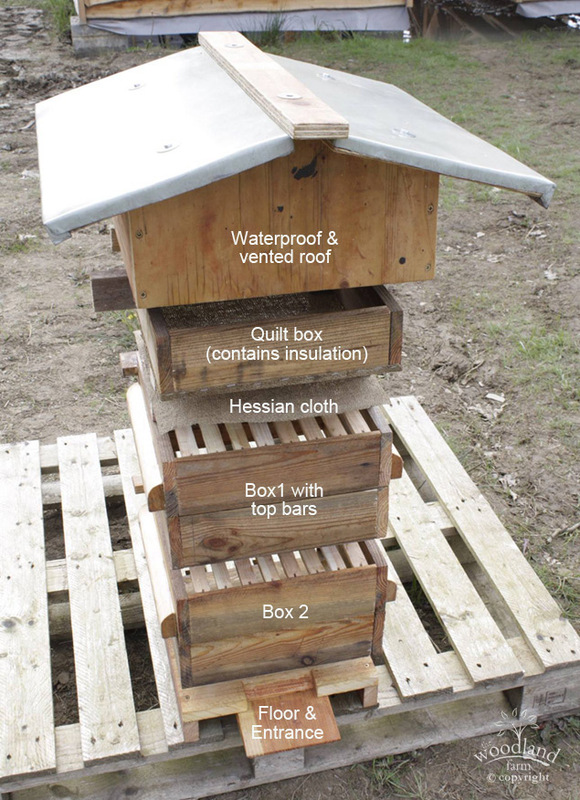 We decided to use a system of top-bar natural beekeeping using Warre hives. Steve made all of the hives from waste wood. The Warre is a smaller (and warmer) hive than the traditional or national beehives most beekeepers use. There are no queen dividers so the only time you are able to take honey is when its capped in Box 1 and the queen and brood are all in the lower boxes (Box 2 and the additional boxes beneath this). The bees have to extrude all of their own comb – there are no pre-formed frames just a series of bars each having a slither of wax along the length of each. This means the bees decide the cell sizes of the comb according to what they need (and believe us they are very very different!) Also the quilt box at the top (filled with wood shavings or straw) provide insulation to help maintain the temperature in the hive (and health of the bees). The scale is important in keeping the colony at the heart of the hive warm through the winter. You don’t go into the boxes to inspect – but Steve made our hives with viewing windows to enable him to monitor progress and identify when space is getting tight and new boxes are needed. You can see from our first hive that exterior-plywood is no good for the roof. Steve now uses marine ply covered with metal. Once the first swarm was caught and introduced in the hive (2014) we allowed the colony to grow in size and took no honey at all in the first year (meaning the bees could use thier own stores to go through winter). 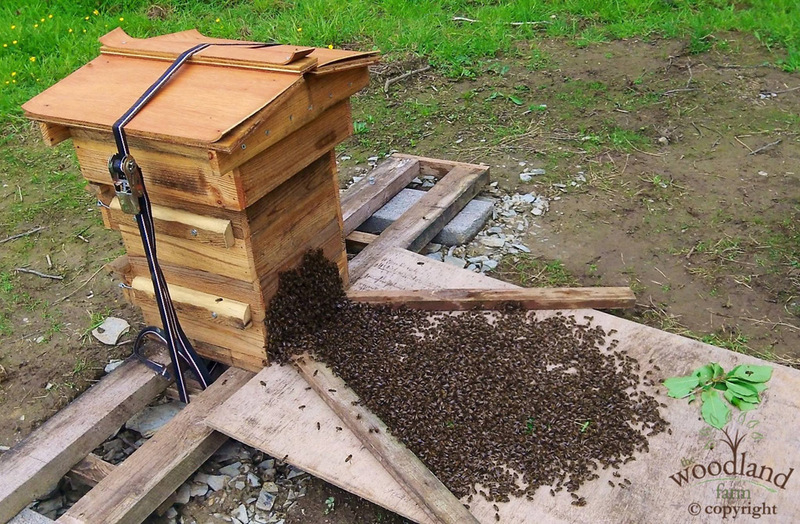 This year we’ve had 2 swarms from this hive (we caught and homed both in new hives) plus we caught a new swarm from a farm at Treffgarne near Wolfscastle. We knew there were queens waiting to hatch (causing a swarm) because the queens who are yet to come-out of their cells begin “piping” – making an unusual repeat beeping noise alerting the workers (and old or rival queens) she is ready to emerge. 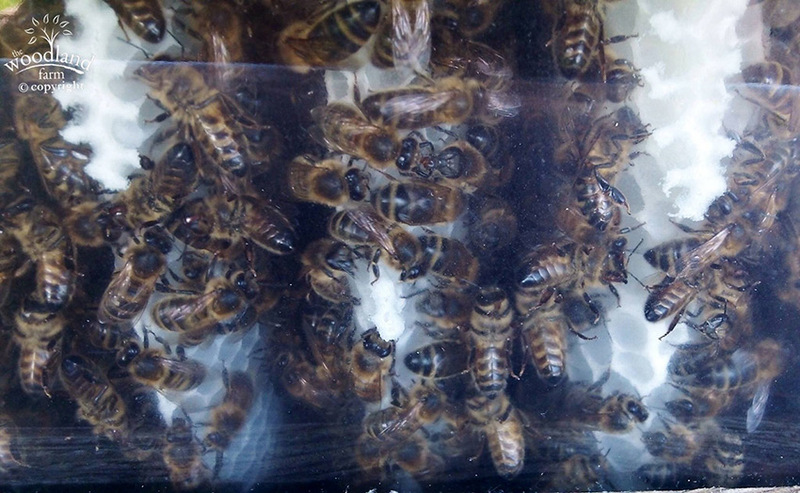 Managing swarms rather than killing excess queen cells allows natural selection by the bees rather than an un-natural selection by the beekeper. 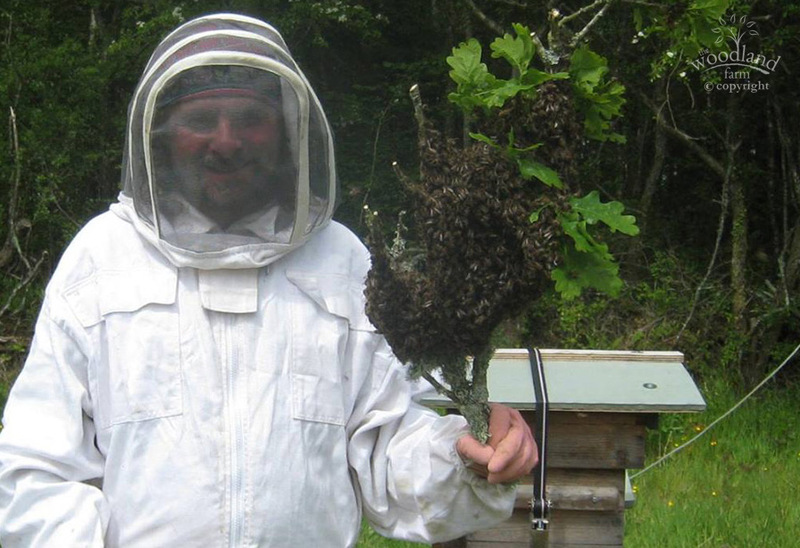 There is a risk your swarm might take off before you catch it – but usually swarms rest in nearby trees or bushes when they first emerge and only swarm when the weather is appropriate. Many ‘traditional’ beekeepers don’t hold with natural beekeeping methods as they are fearful that natural beekeepers might allow bees to swarm unchecked and spread diseases but also they find it hard to understand why we don’t just maximise the honey ‘take’ and feed our bees sugar to see them through the winter. All bees have some varroa mites of course but we know that bees make and store the best natural medicines for bees in the honey they make especially if they have a good diversity of forage. 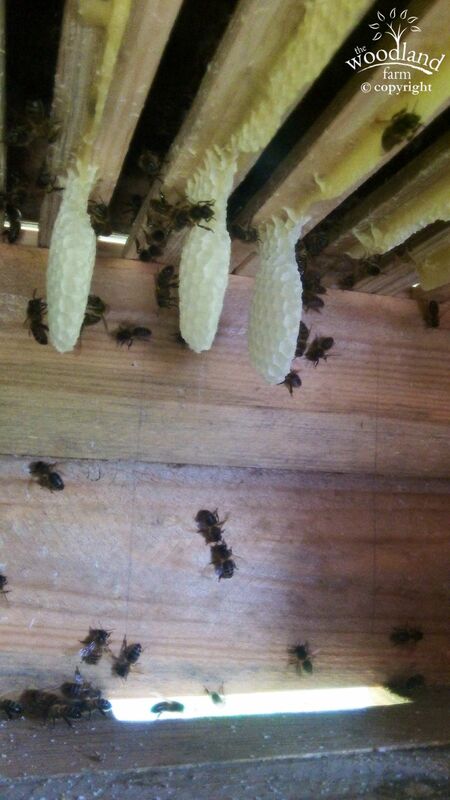 Swarming also removes the bees from the hive environment and breaks the cycle of breeding by the varroa mite. If we help our bees to grow strong resistant colonies where the bees are in control of themselves more – especially managing their own food supplies and temperature through winter then they are also better able to manage-down the mite burden and resist other diseases. We do still check our hives periodically for more serious diseases and have regular checks from the local bee inspector.